Earlier this year, it seemed that Samsung had wrapped up the annual contest to decide who will provide Apple with the chips for the next iteration of the iPhone. In fact, just a few weeks ago, there was talk that Samsung had already started delivering 14nm A9 samples to Apple. And Sammy's perennial rival for the business, TSMC, will only be able to cut its 16nm wafers in any quantity starting in the second quarter of 2015. Using the 14nm process will allow Samsung to make the A9 chip 20% more powerful, while consuming 35% less battery life than the A8. But don't cash your tickets in just yet. 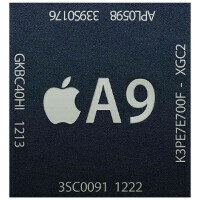 A report out of Taiwan says that Apple will give the bulk of the A9 business to TSMC, leaving Samsung as the second-string provider. The report says that it is a matter of yield. TSMC can apparently produce more chips efficiently than Samsung can. Apple would never leave a part as important as the SoC for its iPhone in the hands of just one manufacturer, so no matter the situation, both TSMC and Samsung can be assured of cashing some checks from Apple. TSMC produced most of the A8 and A8X chips found in the Apple iPhone 6 and Apple iPad Air 2, respectively. Apple is expected to unveil the Apple iPhone 6s and Apple iPhone 6s Plus in 2015. The handsets will feature an incremental update over the Apple iPhone 6 and Apple iPhone 6 Plus despite earlier rumors that the handset will be equipped with a glasses-free 3D screen. But....but 14 nm. Why can't Apple get this thing that Samsung has better 14nm FinFet. While TSMC doesn't even have 16nm yet. This can lead to samsungs monopoly in SoCs with only the exynos ones having 14 nm. And can you explain how is samsung's 14nm better than TSMC's 16FF+ ? And can you plese explain me how "samsung has better 14nm while TSMC doesn't even have 16nm yet" ? Where are 14nm samsung chips ? Actually TSMC is well ahead in terms of process technology. While TSMC introduced a 28nm process in 2012 (all those snapdragons) samsung begun to produce 28nm in small quantities in first half of 2013 and they started mass production with the introduction of iPhone 5S and it's 28nm A7 SoC, or about a year later than TSMC. This year samsung had just begun with their 20nm process in August (samsung galaxy alpha and few galaxy note 4's). But TSMC had started mass producing 20nm before so they can comfortably make enough 20nm chips for iPhone 6, 6+ and iPad Air 2. And now if you were Apple what would you take ? Stuck with samsung and it's 28nm or go with TSMC and their 20nm ? Bleeding edge products like iPhone 6 wouldn't be possible with a 28nm chip. And now aggain, maybe samsung got a 14 nm FF process, but with what qualities and in which quantities ? And maybe it's 14nm but is it better than 16nm ? Because both of these processes use older interconects, size of tranzistors doesn't matter that much, but who will implement FinFet better does a lot. Apple will chose the best technology, like always. But whatever they will choose the FinFet tech will bring some serious battery savings. And because of their high volume they could possible prevent other players from getting to lower nodes like this year with 20nm. Read this: http://www.phonearena.com/news/Samsung-already-delivering-14nm-A9-chipset-samples-for-the-iPhone-7-to-Apple_id63737 BTW, The exynos 7420 to be used in galaxy s6 is 14 nm. I own the air 2 and the A8X is a complete beast and better than any chip in the market. Also the exynos 5433 used in note 4 is superior to the Apple A8 in every way. And it's a 20 nm HKMG. i can see from previous that ure a processors fan so can u tell me if if u think that exynos 7 octa (5433) is the processor of the year ??? Technically, a8x is better but for smartphones, nothing beats 5433. BTW , those 14nm are actually still on 20nm ; just using FinFET ..
Nope. The 20 nm ones are HKMG. Nope both TSM 16 and Sammie 14 are just 20 with FinFETS. Neither are true shrinks like Intel 14 nm. Google it. Didn't know that. So the technology is 14 nm but the transistors are 20. Am I correct? samswg exynos is good but when it have The same spec with qualcomm I go to quatcoMm Samsung need To make somthing special about exynos something That only works with Sammy's phones and making it more compatible with it than any other devices then exynos will rock and beat qualcomm. Apple doesn't want Samsung to peek at A9's internals to improve Exynos. With TSMC, Apple doesn't have to worry about this since TSMC doesn't make SoCs of their own. Sooner or later, Samsung will have to ditch either Exynos or foundry. They cannot keep both. Stop acting like an iDiot. You're worse than that. Read my post that you replied to and call me a fanboy again. You said exactly what I said. Well, if Apple wants to stay with 16nm tech, so be it. The rest will lead the way with 14 nm. Go Exynos.